Rory McIlroy laments a missed putt on the seventh green at Lake Malaren GC. Photo by golffile.ieRory McIlroy can do little wrong these days as he bids to complete a money list double on both sides of the Atlantic. And while he trails Ryder Cup team mate Peter Hanson by a stroke heading into the final round of the $7m BMW Masters at Lake Malaren, the world No 1 does not appear to have moved out of second gear all week. As Hanson followed his 64 with a steady 70 to move to 16 under, McIlroy closed the two-shot overnight gap to one with a three-under par 69 without appearing to break sweat. “It’s just great also to play alongside Rory, and every chance you get to compete with the world number one it is just a fantastic thing to do,” Hanson said. While the South African George Coetzee is alone in third on 13 under thanks to a 66, there are four Irishmen in the top 10 with Shane Lowry (69) and Michael Hoey (68) tied for fourth with Luke Donald, Alex Noren, Justin Rose and Charl Schwartzel on 11 under. Major company indeed. Graeme McDowell, who has struggled to perform since the end of the major season, showed signs of life with a 66 that moved up to tied 10th on 10 under with another slew of great players - Louis Oosthuizen, Nicolas Colsaerts, Martin Kaymer, Paul Casey and Ross Fisher. McDowell was happy to show signs that his game is moving in the right direction again in an event where the stellar leaderboard sets up a fascinating final day. That said, McIlroy looks as though he is out for a stroll in the park. He’s made just two bogeys in 54 holes and the ease with which he plots his way around Lake Malaren, where he won last year when the event was an unofficial invitational tournament, was not lost on his second round playing partner Hoey. “I saw Rory yesterday, very relaxed, I learned a bit from that,” said Hoey, who knows he will easily move from 61st into the top 60 who will contest to the Dubai World Championship if he continues to play as solidly as he has this week. Hoey knows he must become more consistent but having seen than he is not far from Kaymer’s level - “a putt here, a putt there” - he’s happy he is learning to deal with his weaknesses. “My rhythm gets too quick when I try to force it, so I play my best when I give myself a little bit of time at the top, and really just breathe,” said Hoey. As for McIlroy, he is hoping to win the $1.166m cheque at Lake Malaren and take a hige step towards winning the Race to Dubai next month. “It would mean a lot if I could successfully defend here at Lake Malaren. It would be nice to win for a second time,” McIlroy said. Lowry continues to impress at the highest level but while he has plenty of time on his hands, he could make the leap into the world’s top 50 if he finishes in the top three today. Darren Clarke shot a one under 71 to move up to 62nd place on four over while Paul McGinley posted a two over 74 to fall back to 70th on seven over. Shane Lowry has work to do to catch McIlroy and Hanson but the top 50 beckons with a top finish in Shanghai.Shane Lowry has the world’s top 50 and Rory McIlroy in his sights after firing an immaculate eight under 64 in the second round of the BMW Masters in Shanghai. 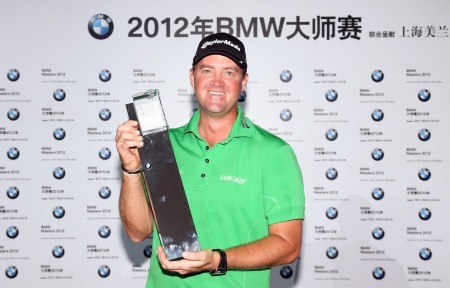 BMW Masters champion Peter Hanson has a chance to win the Race to Dubail. Pic: Getty ImagesAs Shane Lowry edged closer to $1 million this year, Rory McIlroy will take his season’s earnings beyond $13 million when he goes head to head with Tiger Woods at an exhibition match in China today. 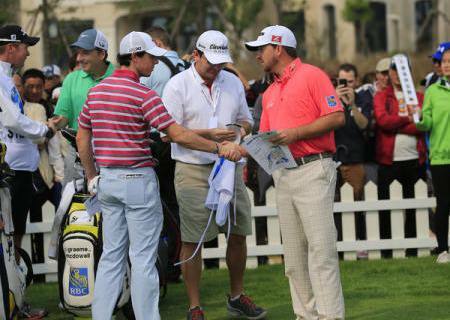 Rory McIlroy and Graeme McDowell shake hands on the first tee Lake Malaren. Picture: Eoin Clarke/www.golffile.ieRyder Cup captain Paul McGinley won’t leave Shanghai with a boost to his Race to Dubai tally. Any prize money he wins in the BMW Masters will go straight into his bank account but won’t, as a sponsor’s invitee, count in the order of merit. He will, however, leave China knowing that whatever collateral damage Rory McIlroy’s acrimonious split from Horizon Sports Management caused to his relationship with Ryder Cup partner Graeme McDowell, it hasn’t made a hole below the waterline. No doubt, he’s pleased now that he made the decision to travel rather than take a much needed week off. 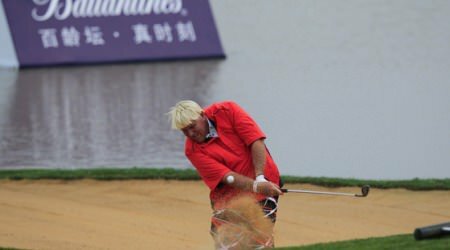 John Daly (USA) chips from a bunker onto the 18th green at the end of Friday’s Round 2 of the 2013 BMW Masters presented by SRE Group held at Lake Malaren Golf Club, Shanghai, China. 25th October 2013. Picture: Eoin Clarke/www.golffile.ieRory McIlroy believes he’s getting away from being a fair weather golfer and close to becoming a wind player who can do battle with the best. 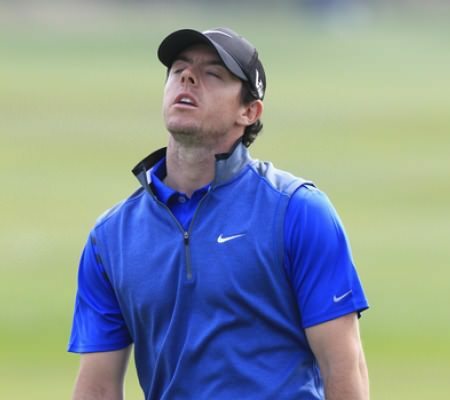 Rory McIlroy shows his frustration after a missed putt at the eighth. Picture Eoin Clarke/www.golffile.ieRory McIlroy might be looking “ominous” from tee to green but the world No 6 was furious to close with a double bogey in the BMW Masters. Relive the magic of "The Irish Majors"